GetLostYouPsycho wrote: I checked 3 Walgreens today. Nada. I’ve been to a few Walgreens today and seen the Halloween set up but no minis yet. The hunt continues! Looks like the last set of exclusives hopefully is fye! Only 1 pennywise exclusive and it’s 1/24. Hopefully not too hard to find because the closet fye is 45 mins away! Thanks!!! Yea it made everything a little better. Oh sweet! Did you get the 1/72?! RBlue30 wrote: Looks like the last set of exclusives hopefully is fye! 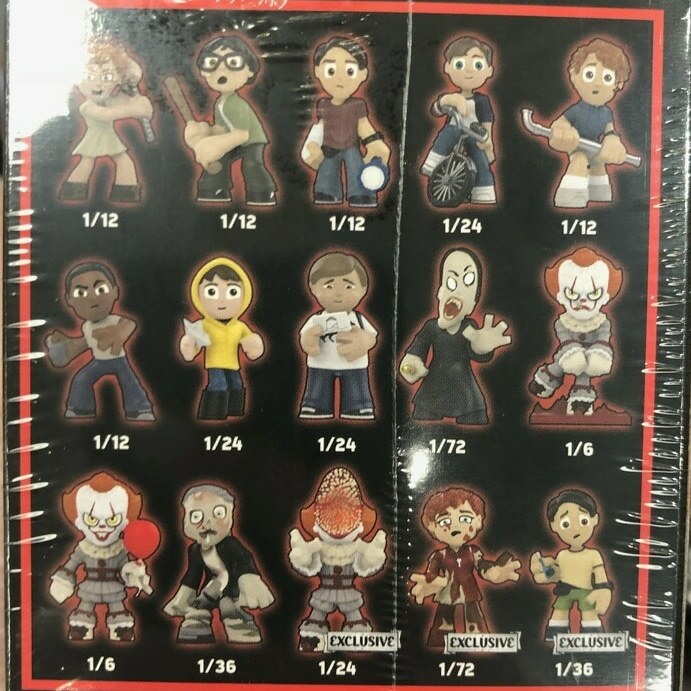 Only 1 pennywise exclusive and it’s 1/24. Hopefully not too hard to find because the closet fye is 45 mins away! well, FYE will be hopefully easy for me. I've got two within a reasonable distance. I will help as many people as I can with the exclusives as I find them. FYE always seems to re-stock minis frequently, so hopefully this will be no exception. Was this announce somewhere? Do you have the link? Yahoo! Just saw that, very happy! Edited: Also I was thinking its weird Funko has been quiet with these releases. Is there a reason for this? They did the same thing for the walgreens horror last year. :? Last edited by ShyGuyPal on Thu Sep 06, 2018 6:18 pm, edited 1 time in total. Someone has the Pennywise opening his face exclusive up on ebay already so they must be starting to hit stores now. bakivali wrote: Someone has the Pennywise opening his face exclusive up on ebay already so they must be starting to hit stores now. Exactly - take a look at the frozen Jack from the Shining that was last year's Walgreens exclusive. It had quite a jump, then settled a bit. PPG has it at $21 but it might be closer to $30 if you were actually looking for it now. But still, there is hope as these start coming out more! Thanks. But Damn! There is only one fye in my area. dang! you must've gotten it quick! i didn't see the listing, only saw it when i looked at the sold ones. congrats! I would love to collect all of these, but at this rate the exclusives will be the death of me. 1/24 rare variants of Pennywise at Hot Topic and FYE are tough, but it's the 1/36 and 1/72 variants at Walgreens that are gonna kill me. I'd love to at least get all ten of the various versions of Pennywise (the seven clown variants and his Leper/Painting Lady/Georgie forms). bakivali wrote: Exactly - take a look at the frozen Jack from the Shining that was last year's Walgreens exclusive. It had quite a jump, then settled a bit. PPG has it at $21 but it might be closer to $30 if you were actually looking for it now. But still, there is hope as these start coming out more! Same here, I hunted these last year and never found frozen Jack. He will be mine someday to go with his chase pop! ZartansBro wrote: I would love to collect all of these, but at this rate the exclusives will be the death of me. 1/24 rare variants of Pennywise at Hot Topic and FYE are tough, but it's the 1/36 and 1/72 variants at Walgreens that are gonna kill me. I'd love to at least get all ten of the various versions of Pennywise (the seven clown variants and his Leper/Painting Lady/Georgie forms). THe WG 1/72... FYE and TWO HT Exclusives are gonna be a pain in my A$$ to get!! Wait a minute...there's one of Pennywise as Georgie?! Where?! How did I miss this?! Walgreens and FYE will be the pocket $$$ killer for me. Because Walgreens are hard to find and the closest FYE for me is around two hours away. Does FYE usually get restocks? Georgie without an arm a few times to mess with Bill, especially shown right before the fight at the end. When you order a full case, does it come with the cool display box? I'd love to have that in my collection. YeetGrimes wrote: When you order a full case, does it come with the cool display box? I'd love to have that in my collection. You mean with the back display that sits above the mini boxes? If that's what you mean. Your answer is yes. It is an open box and comes with that back stand. HellKat613 wrote: Does FYE usually get restocks? I don't think they've ever had exclusive minis before, but they do re-stock pretty heavily with regular minis. My FYE would get a fresh case of the LOTR ones every 2 weeks or so, it seemed. Found 3 fresh cases at Hot Topic right now. Bought the right middles and got 1/36 Ben and 2 1/72 Bill with flashlight. My best pulls in a while.